This cake was created for one of my colleague’s sons who graduated from high school on Wednesday… The cake is chocolate with chocolate buttercream filling and tinted vanilla fondant. It’s fashioned to resemble the traditional graduation cap (or mortar board). 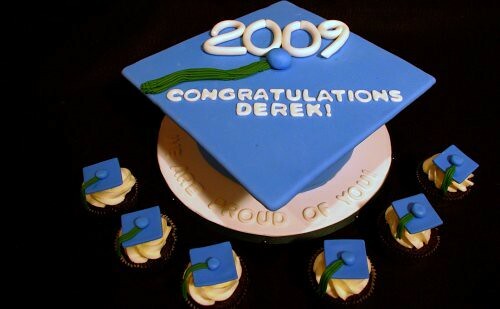 The cake was accompanied by a dozen graduation cap cupcakes, which were chocolate with vanilla buttercream frosting. It’s graduation season! I’ve got several graduation cakes in the works over the next few weeks… and here is the first! 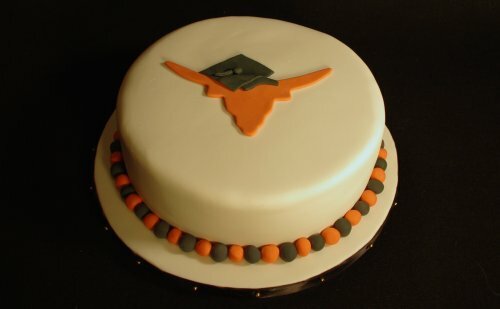 This cake is celebrating a Longhorn graduation - it’s a rustic carrot cake filled and iced in cream cheese buttercream. It’s also covered in a thin layer of vanilla fondant and decorated with custom Longhorn-themed fondant accents. Congratulations!